(Bloomberg) -- The murder of a prominent mayor in office for two decades has exposed Poland’s increasingly febrile politics under the country’s nationalist government as shock and grief turned to acrimony over who was to blame. Pawel Adamowicz, 53, was stabbed at a charity event in his city of Gdansk on Sunday evening and died the following day. The assailant told the crowd he was avenging his treatment by the former government led by Civic Platform, the party now in opposition that Adamowicz represented. While the country’s president called for a period of “soul searching,” hours later the main state-controlled television channel said the killing was a result of opposition parties triggering a rise in hate speech. A lawmaker allied to Civic Platform called for a public apology while a former deputy prime minister started a petition to replace the head of the broadcaster. The shock death comes amid widening divisions across Europe and rhetoric that’s unleashed violence in some parts. British politician Jo Cox was attacked and killed in 2016 during the Brexit referendum campaign. Last week, German far-right lawmaker Frank Magnitz was beaten unconscious. In Poland, the first murder of high-ranking official since the end of communism brought tens of thousands out on the streets on Monday night. The dilemma for the Law & Justice government in an election year is how to reconcile the killing with its narrative that after decades of gross mismanagement Poland is finally becoming a “normal” country, said Marek Migalski, a political scientist who used to work with the party. The slaying initially triggered calls by the authorities to keep the tragedy from turning into a political blame game. But the main nightly news program on public television, run by a former Law & Justice lawmaker, broke the uneasy truce. Kamila Gasiuk-Pihowicz from an ally of Civic Platform said TVP should broadcast the phrase “we apologize” for the duration of Tuesday’s main news program. Wojciech Kosiniak-Kamysz, a member of a smaller opposition party and a former deputy premier, said the network had turned into a “machine to divide” the nation. 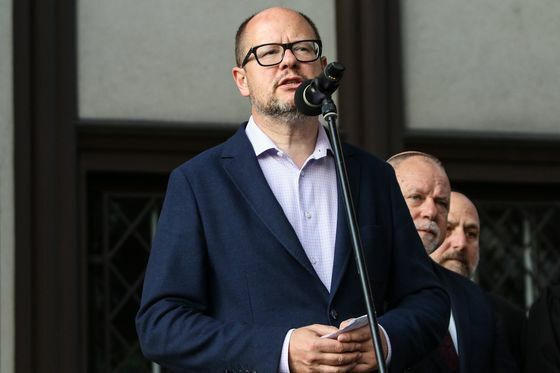 Adamowicz won a sixth term as Gdansk mayor in October as a supporter of gay and immigrant rights in a country whose government rejected taking in refugees, has championed the Catholic church and tried to tighten abortion bans. During the country’s biggest annual charity drive, the assailant ran up to Adamowicz and stabbed him three times in the abdomen. He then introduced himself to the stunned crowd saying he was unfairly imprisoned and “tortured” by the former government. Police said the man was released from prison last month and has had psychiatric treatment. Indeed, Poland has become more bitterly divided since the Law & Justice party won power in 2015 on a pledge to replace the country’s “self-serving elites,” stand up to the EU and grab more control over the economy. In 2017, a far-right group hung photographs of six Polish opposition lawmakers from a makeshift gallows. During last year’s celebrations of the 100th anniversary of Poland regaining sovereignty, President Andrzej Duda and Prime Minister Mateusz Morawiecki walked with 200,000 people through Warsaw, including far-right groups with neo-fascist symbols. While Polish leaders publicly rejected such radicalism, critics have accused the government of failing to keep far-right groups accountable for hate crimes. Law & Justice leaders openly grieved and called for reconciliation on Monday, with Duda calling the event an act of “unimaginable evil” and ordering a day of state mourning to coincide with the funeral, which will take place on Saturday.